Double weave can be a very intimidating weave style to take on. Sometimes just the sheer volume of threads you need to wind and how to thread them through the heddles can seem overwhelming. 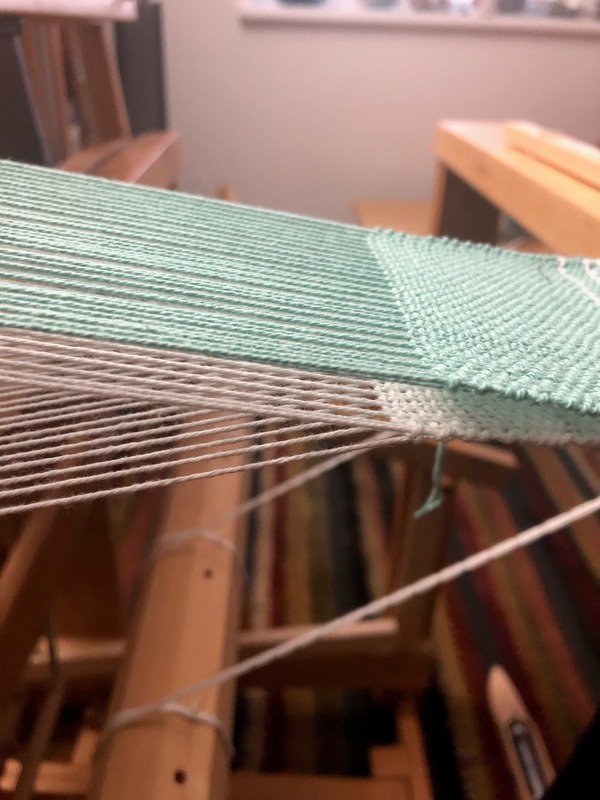 This post covers a simple approach to winding and threading a double weave sample that can be adapted for a variety of projects. This post is the first in a series on double weave. Initially I will cover the setup and warping process for a sample warp. Then I will cover how to use double weave for pockets and tubes, double weave pick-up mug rugs and a double weave block wall hanging. I feel quite lucky to be using 8/3 un-mercerized cotton from Gist Yarn! This yarn has a great rustic and natural feel while being extremely sturdy. 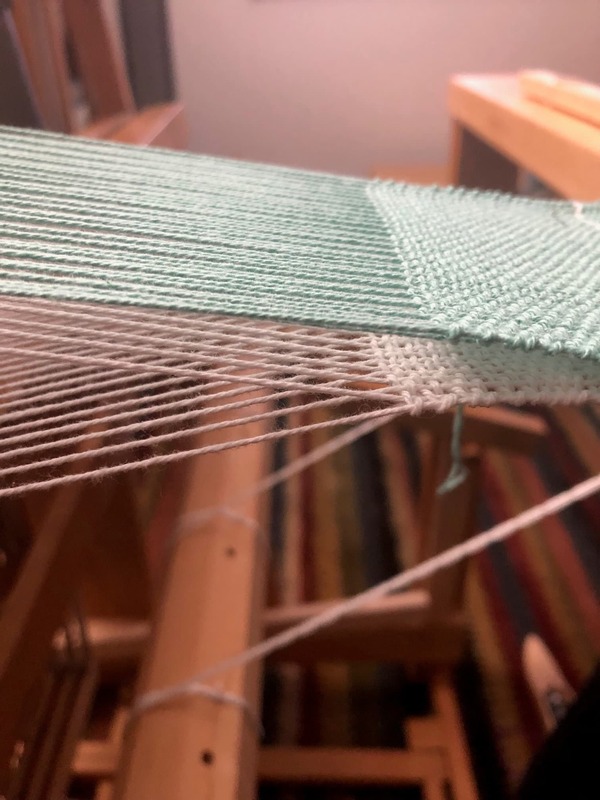 For my sample warp, and the project I’ll include in my next blog, I wanted to have one layer of cloth that would be aqua and one layer that would be white. In order to achieve this with the most efficiency, I wound both colors/layers at once. Using the Goko Swift, I put two skeins side-by-side and wound one yarn from each simultaneously onto the warping mill. In order to keep yarns as straight as possible, I kept one finger in-between the two strands as I wound. Finger separating the warp yarns. For a double weave, you can use as few as four shafts of the loom. Each layer of fabric needs at least two shafts. Because I already wound the warp in pairs of two yarns (one white, one aqua) it was simple for me to thread two yarns per dent of the reed. It is important that the pattern is maintained (one white and one aqua per dent). This makes the threading process simple! Use a straight draw threading that carefully alternates the colors. See draft. When thinking about the tie-up, keep in mind, that you are weaving two layers of cloth consecutively. For the top layer, lift shaft one and pass the shuttle through and then lift shaft three and pass the shuttle through. Now the picks for the top layer are complete. Then it’s time to weave the bottom layer. In order to do this, you need to lift the top layer (shafts one and three) plus shaft two for the bottom layer. Keep shafts one and three lifted, lower shaft two and raise shaft four for the final pick. There are now two separate layers of cloth sitting on top of each other. Two separate layers – aqua on top, white on bottom. First lift shaft two, pass the boat shuttle through, then lift shaft four. The white yarns should actually pass in-between the aqua yarns and make a white stripe. Now to weave the aqua layer on the bottom, lift the entire white layer plus shaft 1 of aqua. Pass the boat shuttle through and then lift shafts 2 and 4 plus shaft 3 of the aqua. This action intertwines the two layers. You may now proceed with either the white or aqua as the top layer. Switching of the layers. White will now be on top. This is the first step to being able to make tubes, pockets and slits which I will discuss in the next post. Look for upcoming posts on double weave pick up and double weave blocks throughout the spring! This traditional Japanese winding tool is the smoothest-turning swift we’ve tried. 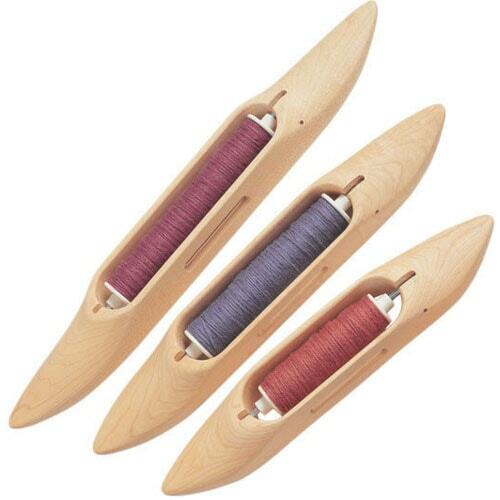 Excellent for fine fibers, it holds skeins 57″ to 64″ in circumference.